In November, OARS and The Graduate School began hosting Miami University’s Discovery Café. Bob De Schutter is a C. Michael Armstrong Professor at the College of Education, Health & Society and the Armstrong Institute for Interactive Media Studies (AIMS). His interdisciplinary research focuses on game design, the older audience of digital games, and the use of digital games for non-entertainment purposes. 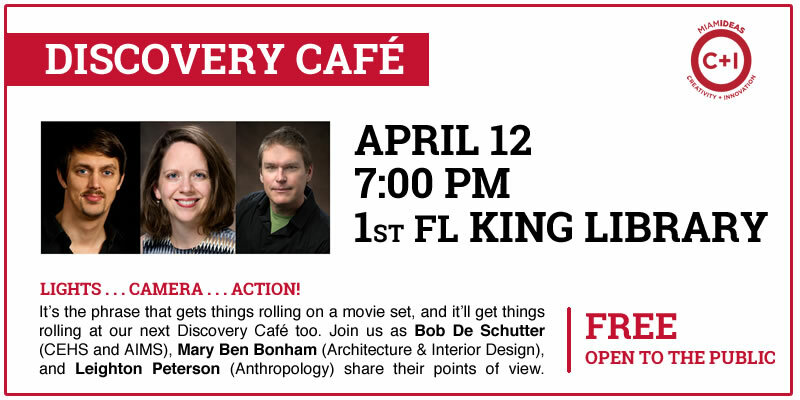 Mary Ben Bonham is an associate professor in the Department of Architecture & Interior Design. Her scholarship focuses on architectural applications of lighting and other areas of building performance. Leighton Peterson is associate professor of anthropology. His scholarship centers on media depictions of Native Americans and Native-produced media. All are welcome to attend the event, which takes place at 7:00pm on Tuesday, April 12, in the AIS on the first floor of Miami University’s King Library. Light refreshments will be served. Photo of March’s Discovery Café audience by Scott Kissell, Miami University Photo Services.